democratic institutions (Modi) to gobble the master Key. decimated in the elections, sought a repoll with paper ballots. 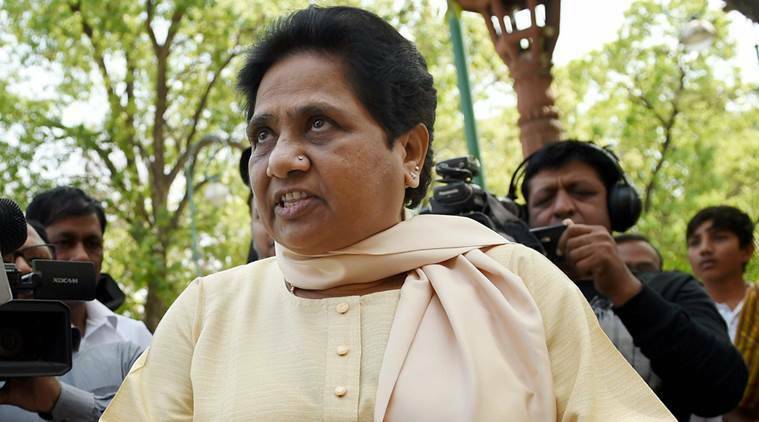 tampering and BJP to keep democracy alive,” she said. by BSP claiming that machines can be hacked and tampered with. MLA, minister of chief minister,” she said. years.so better not keep money in banks. in this direction. Hope justice prevails ! voice . There has been po r groundswell against fascist forces in UP . divorce rate is more among their own cult . “residential court” on April 28.
him “wantonly and deliberately and with malafide intention”. against because he is a Scheduled Caste. He passed the “suo motu judicial order” from his residence which, he said, has now become his “makeshift court”. said, adding it amounted to insulting him in the open court. but the plea was rejected. judicial and administrative powers as a serving high court judge. a pack of wolves, one judge against seven pretty grim situation indeed. India, one way or other, a precedent will be set. by issuing a non bailable warrant. him, to appear before him at his “residential court” on April 28.
insulted him “wantonly and deliberately and with malafide intention”. He passed the “suo motu judicial order” from his residence which, he said, has now become his “make-shift court”. Karnan, said, adding it amounted to insulting him in the open court. as a serving high court judge. the warrant to ensure his presence. he is being discriminated against because he is a Scheduled Caste. in the matter after he levelled accusations against several judges. There is an urgent need to reform the judicial system. The honorable judges have failed to serve the people, and there are constant involvement of judges in exec matters. Judges are not above anyone else. They too must be held accountable. And, it should begin with their appointments. and millions of cases pending for delivery of justice for several decades. And, yet these judges are in-fighting on a clear case of Court contempt? those names to be made public and let the heads roll. him at his “residential court” on April 28.
against because he is a dalit. levelled accusations against several judges. his “residential court” on April 28.
deliberately and with malafide intention”. against because he is a Scheduled Caste . his mind and normal life”. work – an order the Supreme Court has passed against him. He alleged that the contempt order was issued with malafide intention to harass a dalit judge. second time to answer a contempt notice. been ordered to furnish a personal bail bond of Rs 10,000. 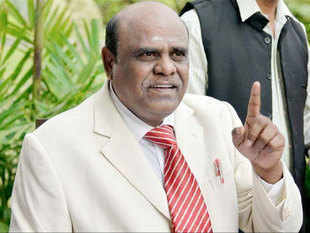 If Justice Karnan fails to appear on March 31, the Bench might issue a non-bailable warrant against him. accusing several judges of corruption. Veteran lawyer Ram Jethmalani had advised him to withdraw his utterances against judges and apologise to the top court. defence available to you though with no bright chance of success. far indulged in,” the former law minister wrote. might put some sense in your head,” read the letter dated March 11.
it,” he had advised Justice Karnan. fraud EVMs be dissolved and go for fresh elections with paper ballots ? executive and the media pillars of democracy. ensure his presence at 10.30 AM on March 31.
by the apex court in a contempt case. at the sl. no. II. below. “What one man can invent, another man can hack,” Mr. Chidambaram submitted. recording the wishes of the electorate,” Mr. Chidambaram said. voter presses is the symbol the EVM registers in the system. Verification of the vote is an indispensable part of voting, Mr.
“Only a paper trail can restore the confidence of the people,” Mr.
with introduction of the paper trail,” it had said. has immense importance in democratic system,” the Bench had said. funds to install EVMs with VVPAT. ways things are proceeding, it would take another 150 years, Mr.
advocate Kapil Sibal for Congress party submitted. booth-capturing, etc,” Justice Chelameswar said. “Science has improved, so has hacking,” Mr. Chidambaram responded. can be shown to the voter to dispel any doubts. electoral matters normally limited to Law and Home ministries. the BJP had talked of EVM tampering on many occasions. roping in private manufacturers as BEL and ECIL have limited capacity. limited in Ghaziabad, to enhance production capacity. deadline to equip all polling stations with VVPATs. “double and treble the voter’s confidence in EVMs”.